Steel twin screw motor vessel, built by Nuovi Cantieri Apuania S.P.A. Marina di Carrara, Italy (Yard No. 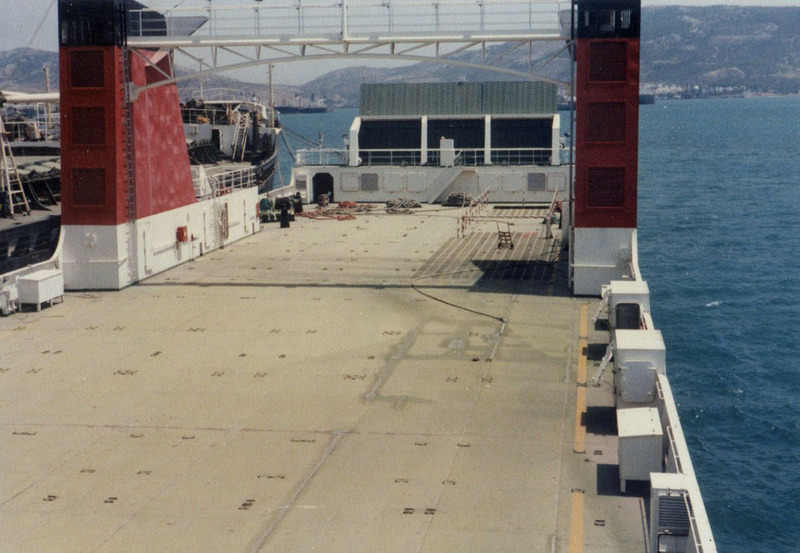 2120) for Castello Hellas Shipping Co, Piraeus, Greece in 1982 as a commercial vehicle ferry. 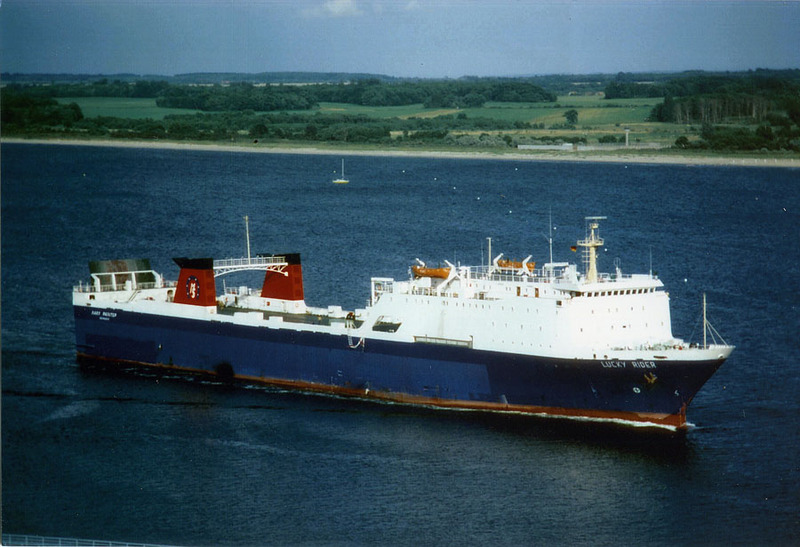 July 16th 1981: Launched for Castello Shipping and Navyglad Shipping Corp, Piraeus, Greece. December 30th 1981: Completed, but problems at her builders meant late delivery. 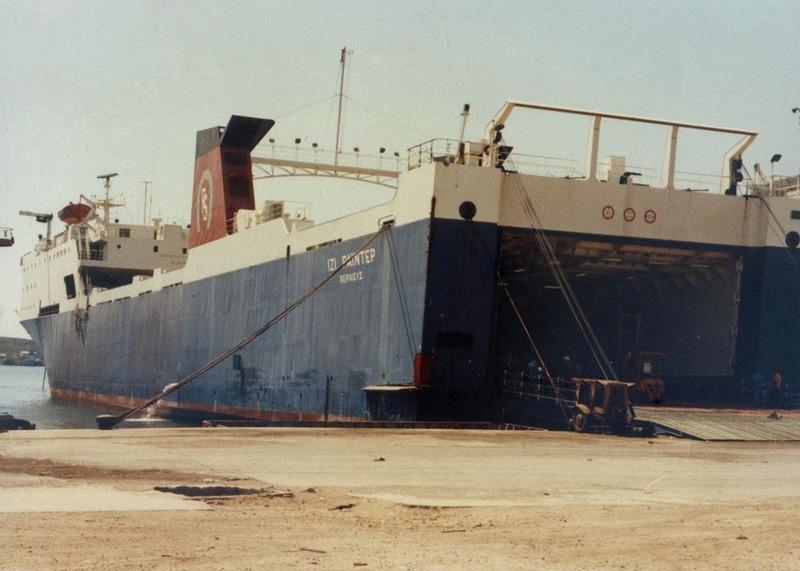 March 1982: Delivered to Delpha Maritime Co, Ltd., Limassol, Cyprus. October 23rd 1982: Chartered to Rederi Ab Nordö, Malmö. Commenced service between Malmö – Travemünde. November 3rd 1982: Suffered an engine-room fire and towed into Travemünde. November 1983: Whilst at her refit in Malmö her owners went bankrupt. 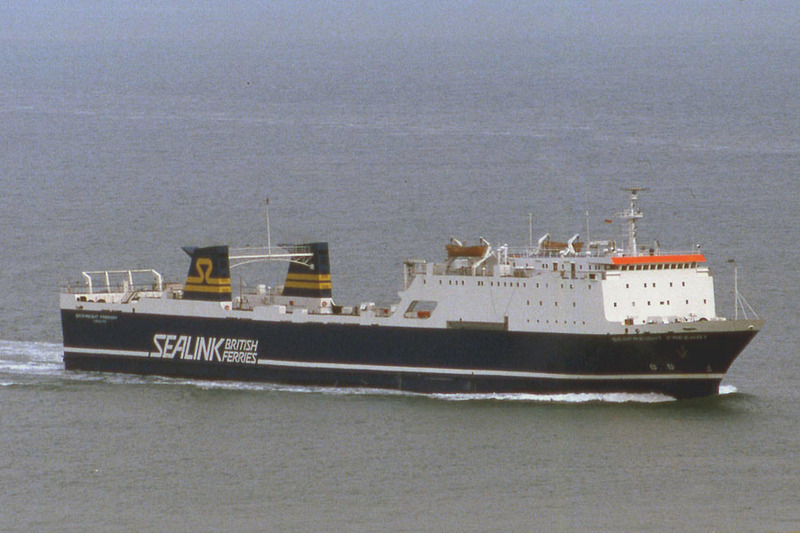 1984: Sold to Stena Ab, Göteborg. Renamed STENA DRIVER. Commenced service between Göteborg – Travemünde. 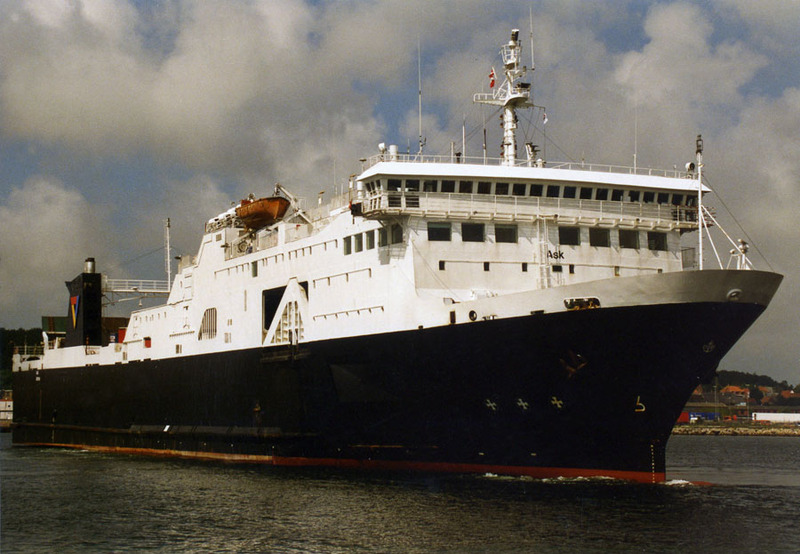 1984: Transferred to Challenger Ltd, Nassau, Bahamas. 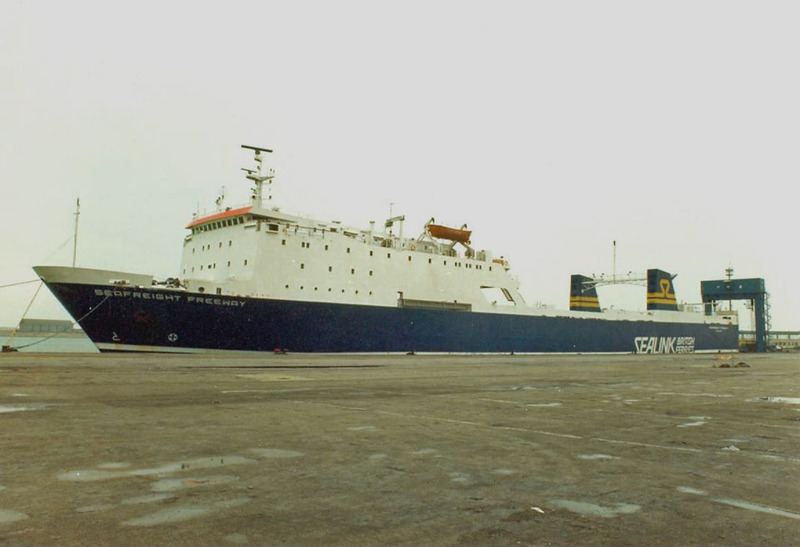 May 4th 1985 – May 21st 1985: Operated between Moss – Frederikshavn. 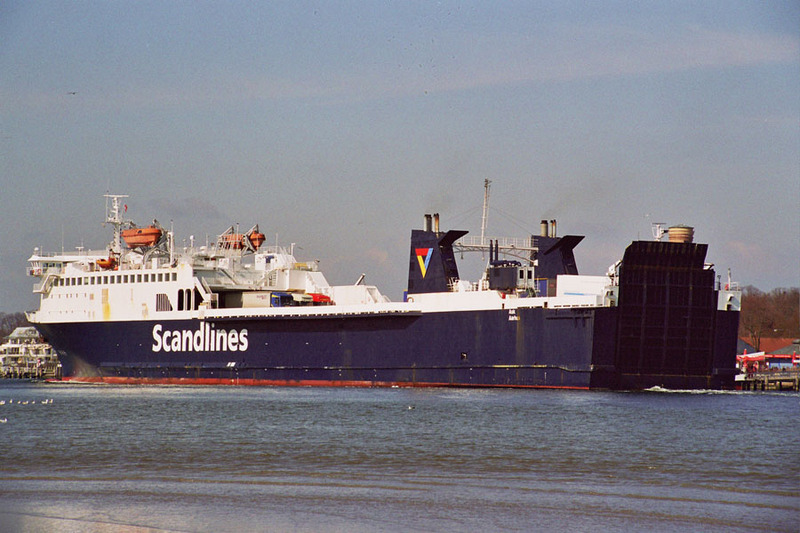 May 22nd 1985: Commenced service between Göteborg – Travemünde. 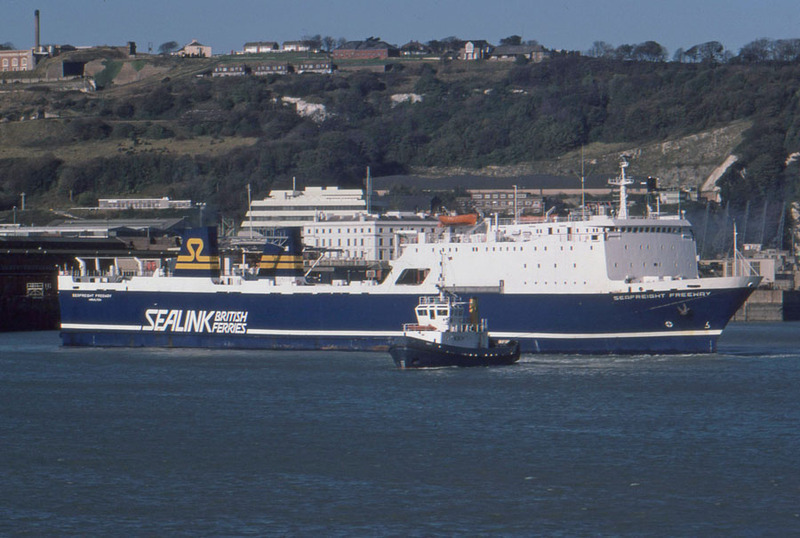 December 1985: Sold to Sealink (UK) Ltd, Nassau, Bahamas. Renamed SEAFREIGHT FREEWAY. 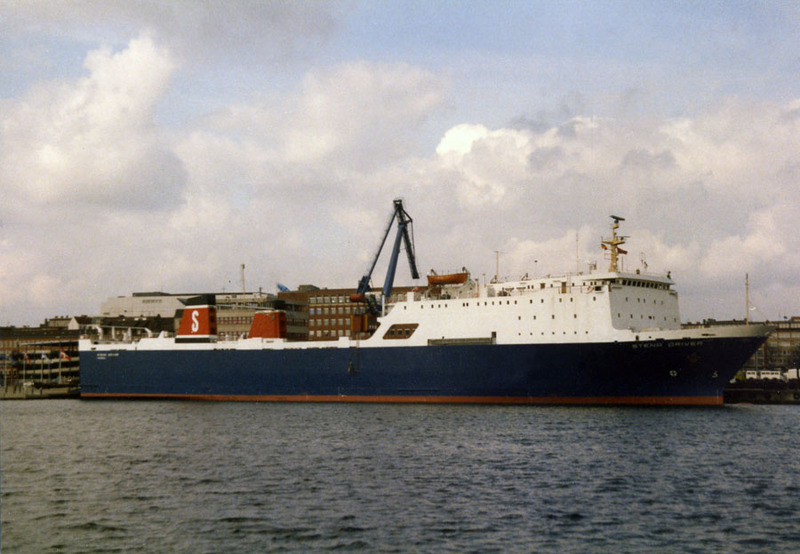 December 1985: Left Göteborg for Blackwater River and then laid up. December 29th 1985: Left Blackwater River for Dunkerque. 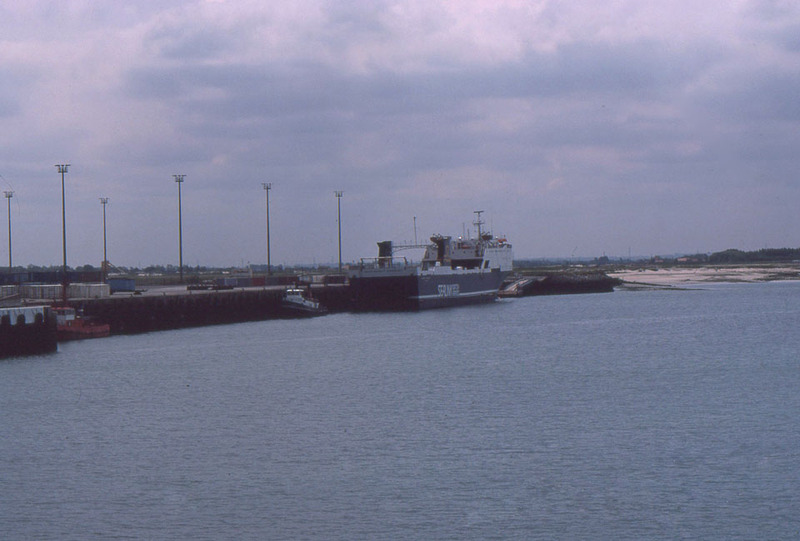 January 1986: Left Dunkerque for Bremerhaven, then to Blackwater River for further lay up. 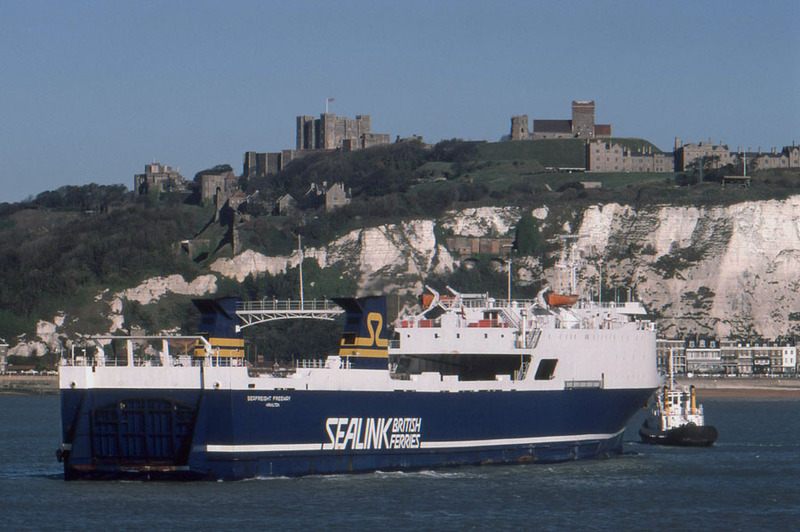 January 21st 1986: Commenced service between Dover – Dunkerque West. December 1987: Fitted with 590 kW Bow Thruster. 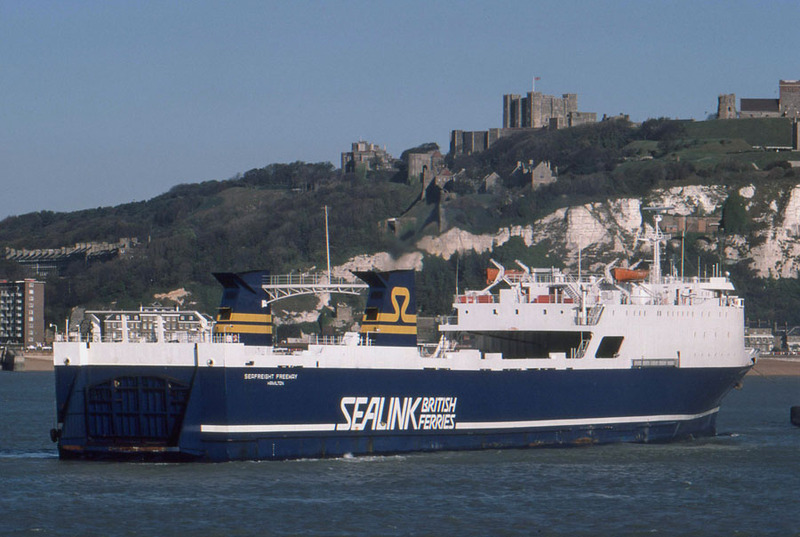 1988: Resumed Dover – Dunkerque after the prolonged NUS strike, then continued Dover – Calais. 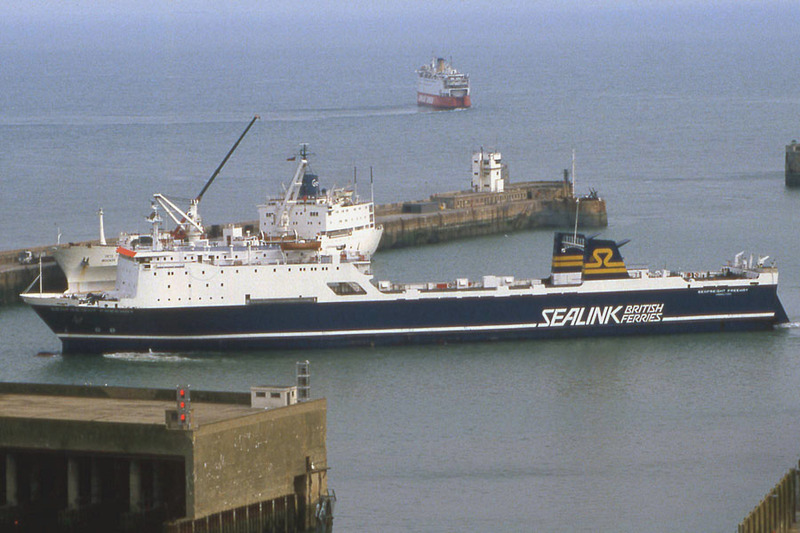 May 23rd 1988: An engine-room fire broke out shortly after the vessel left Dover. “The fire was caused by lubricating oil spraying onto the hot exhaust manifolds of the port engine from the starboard engine oil filter. This happened because some of the cover bolt studs on the oil filter sheared allowing the cover to lift under the oil pressure”. One engineer was killed and one seriously injured in the blaze. Kent firemen were airlifted by helicopter and the ship, carrying 30 crew and 42 lorry drivers, was later towed into Dunkerque by a French salvage tug. Later sent to Lloyd Werft in Bremerhaven. 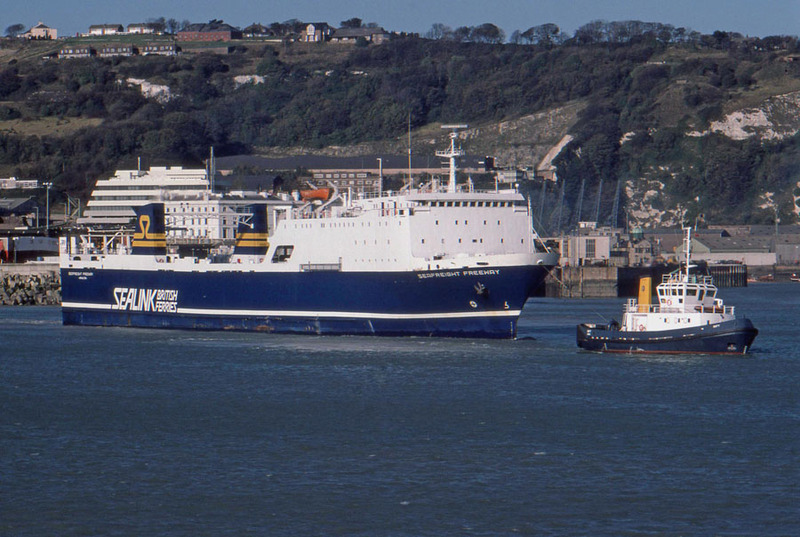 September 15th 1988: An announcement was made that the Dover – Zeebrugge route was to be closed. 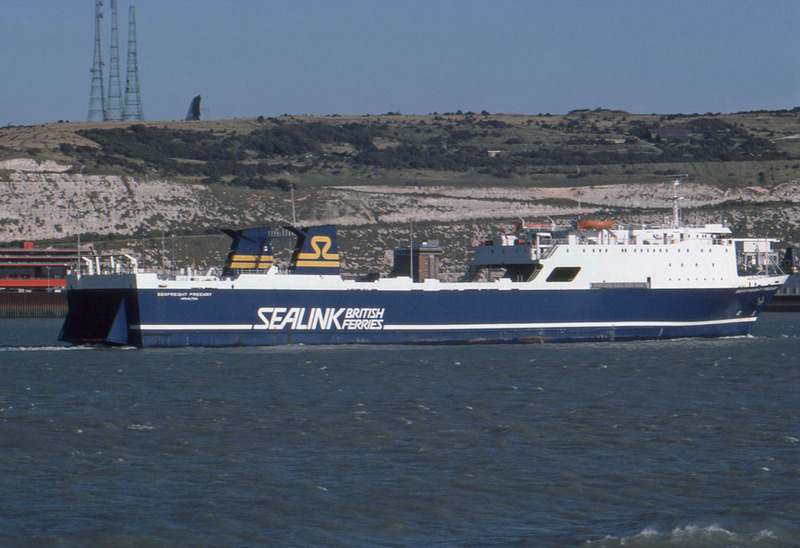 October 16th 1988: Made her last sailing between Dover – Zeebrugge, and then went to lay up in the Fal. 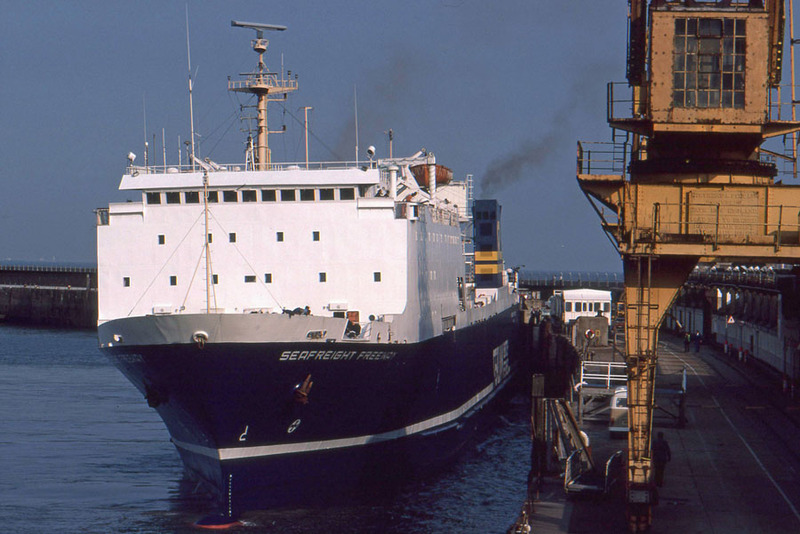 October 1988: Sold to Navigation Maritime Bulgaria, Varna, Bulgaria. (Partly paid for by Tzarevetz). October 1988: Transferred to So Mejdunaroden Automobile Transport (S.M.A.T.) Bourgas, Bulgaria. Renamed SERDICA. 1990: Sold to Hornet Shipping Co, Nassau, Bahamas. 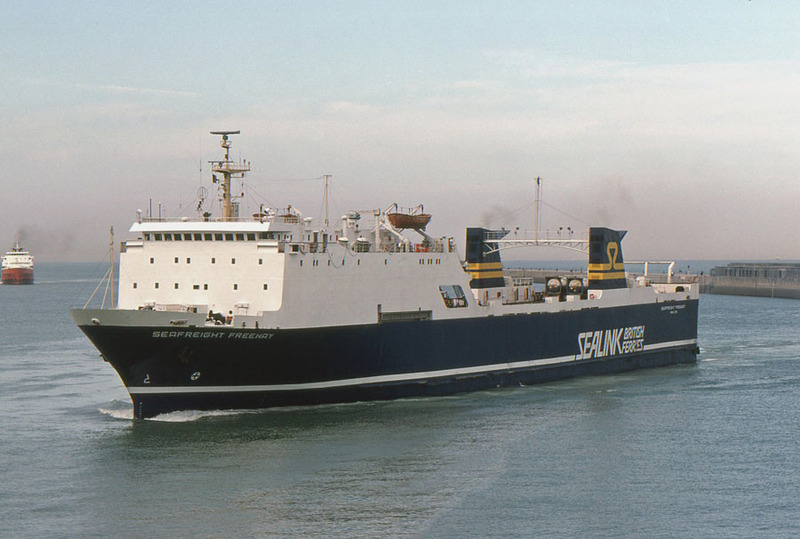 Commenced operations for Swedish Gulf Line, Göteborg. Renamed NORDIC HUNTER. 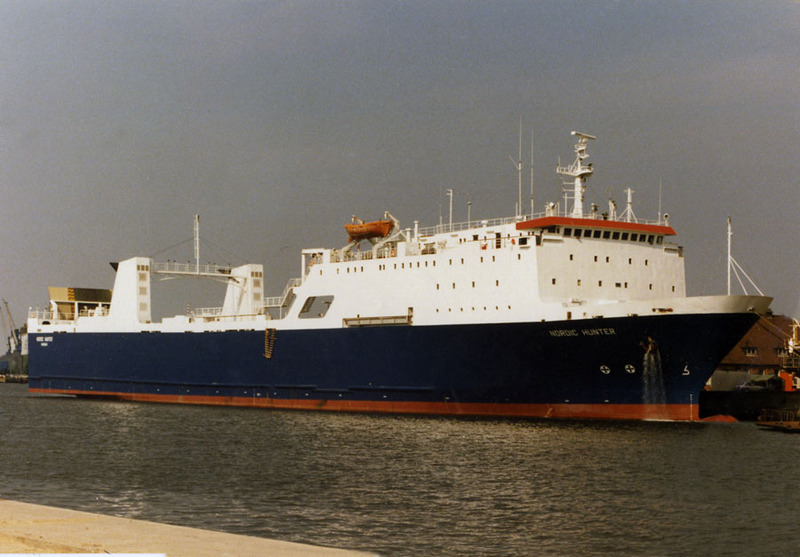 August 1991: Sold to Arka Marine II K/S, Århus, Denmark. Renamed ARKA MARINE. 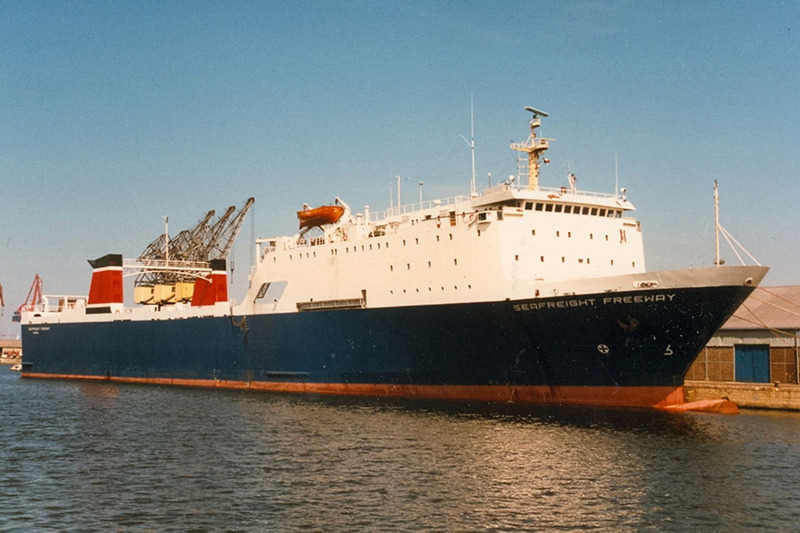 August 1991: Arrived at Seabow/ PZ Dora yard, Gdynia, Poland for rebuilding to car and passenger ferry. 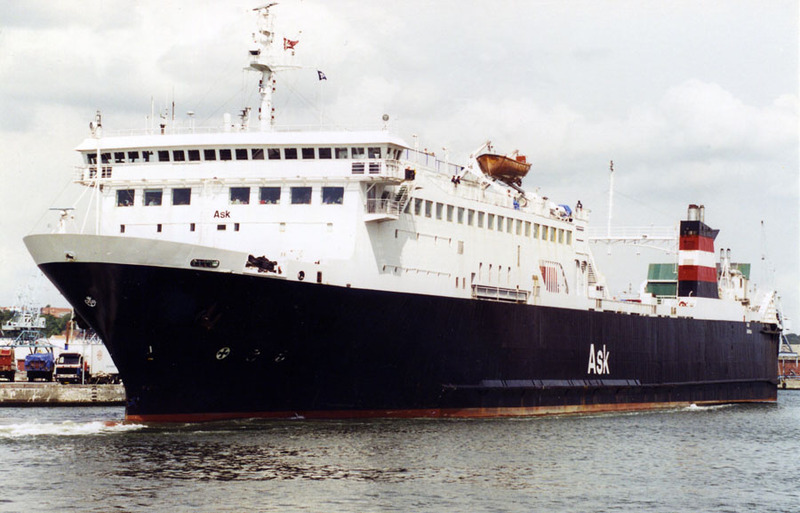 May 1991: Chartered to DSB Ferry Division, Århus, Danmark. Renamed ASK. 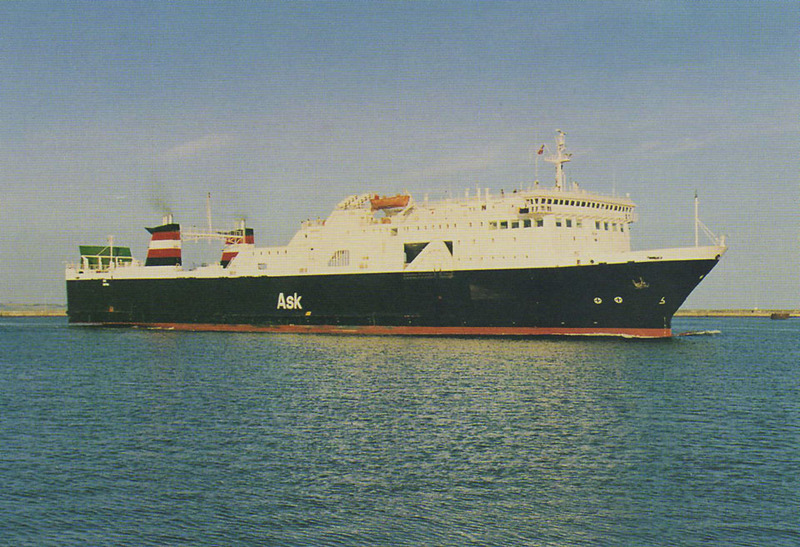 July 1991: Commenced service between Aarhus – Kalundborg. On her first sailing she suffered major engine problems. September 8th 1993 – November 27th 1993: Complete engine replacement at Fredericia Skibsværft, Fredericia. 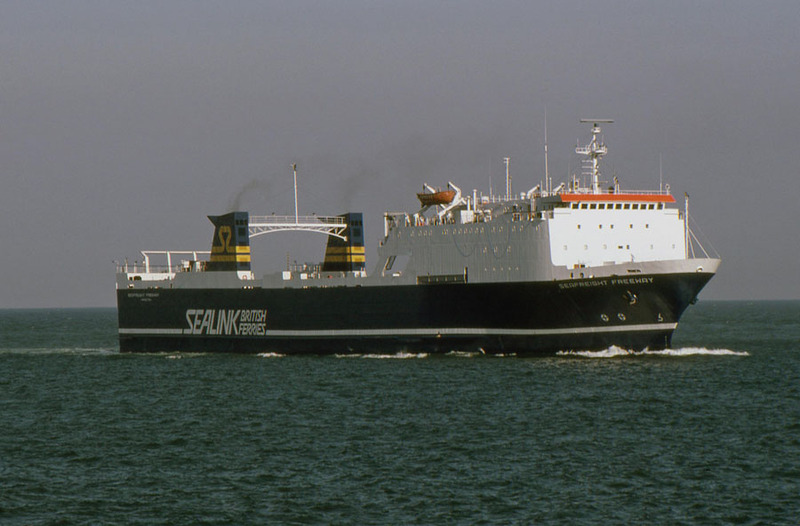 September 1997: Sold to Scandlines A/S, Copenhagen . January 1988: Laid up in Århus. 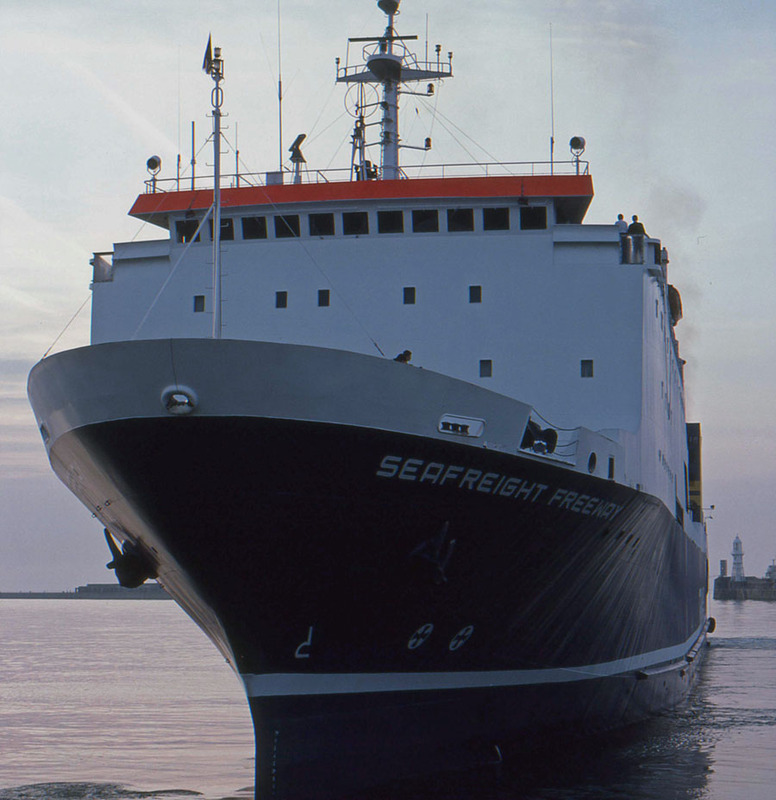 April 1st 1999: Commenced operations for Euro Seabridge between Travemünde – Klaipeda. November 1999: Laid up in Nakskov. January 4th 2000: Commenced services between Rostock – Liepaja. 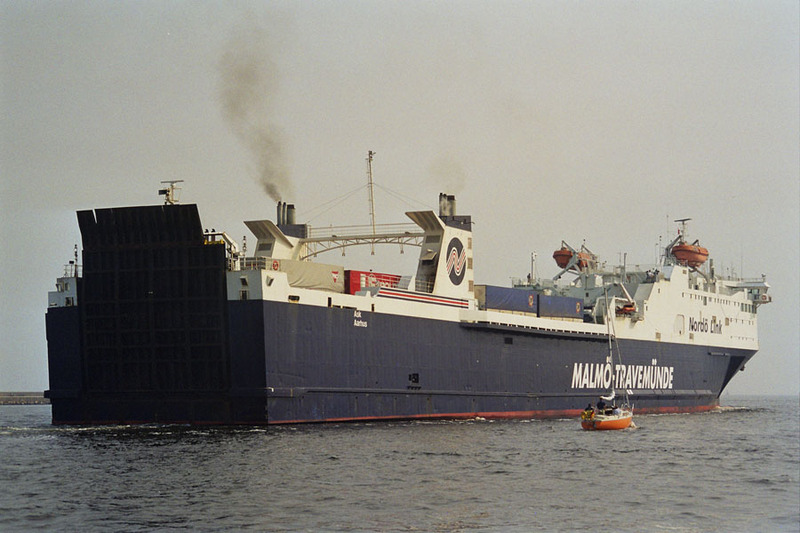 May 25th 2001 – September 28th 2001: Rebuilt and lengthened at Gdansk Shiprepair Yard “Remontowa”, Gdansk, Poland. 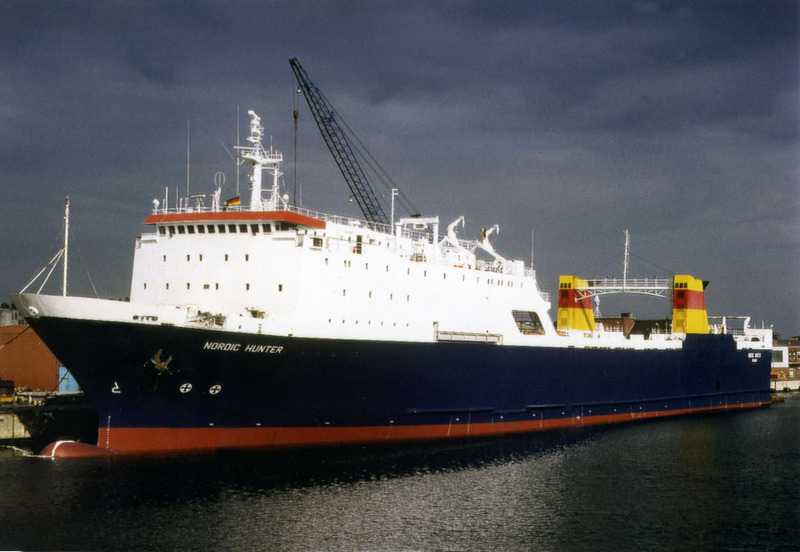 September 29th 2001: Commenced service between Rostock – Liepaja. January 2nd 2002: Chartered to Rederi Ab Nordö Link, Malmö. Commenced services between Malmö – Travemünde. 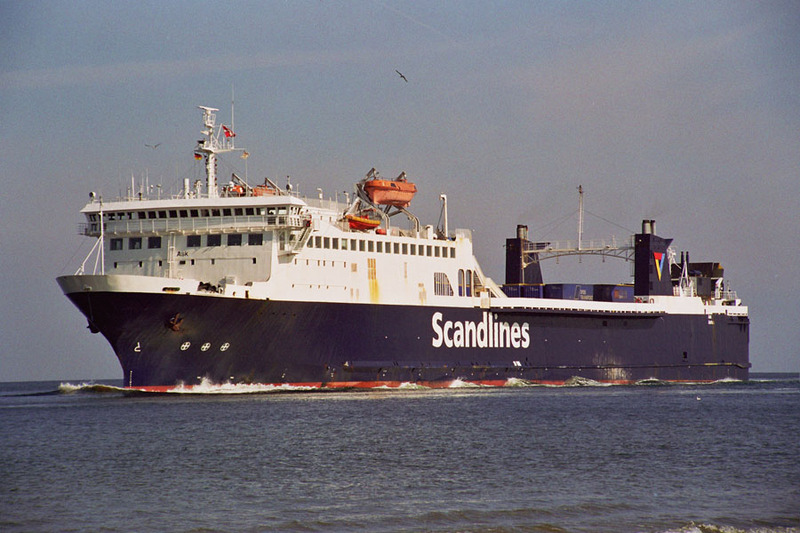 December 21st 2002: Final day operating between Malmö – Travemünde. 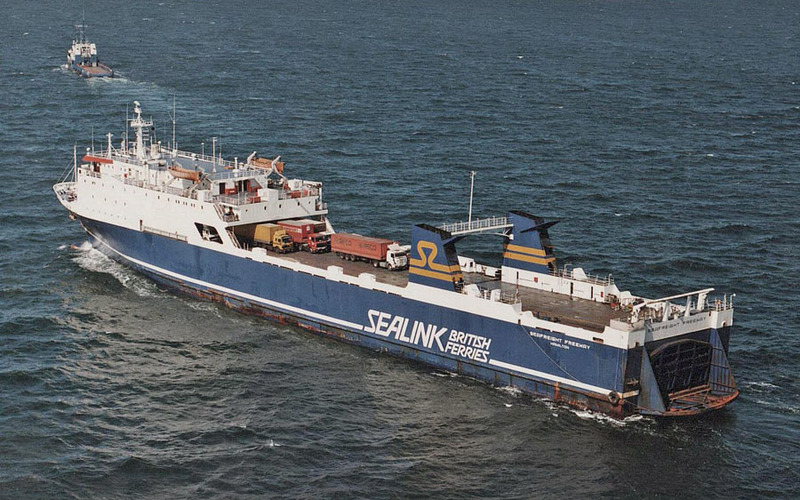 Then she finished her charter with Nordö-Link. 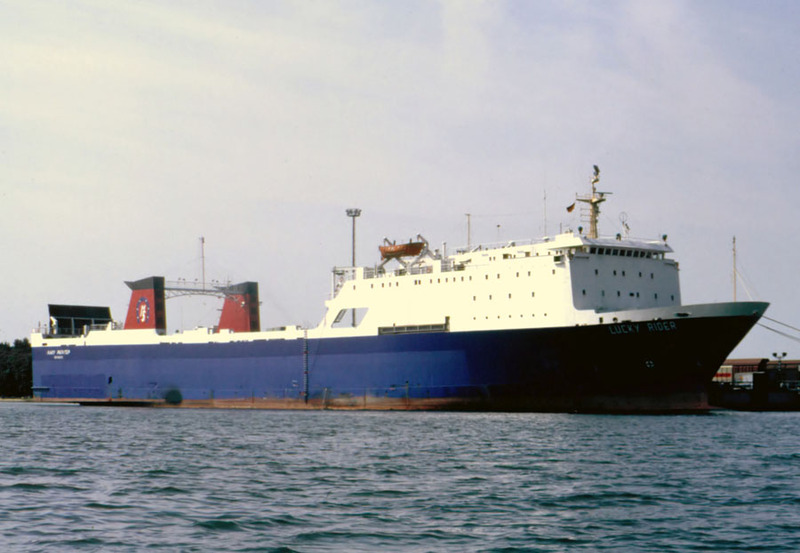 2003: Commenced service between Trelleborg – Rostock. 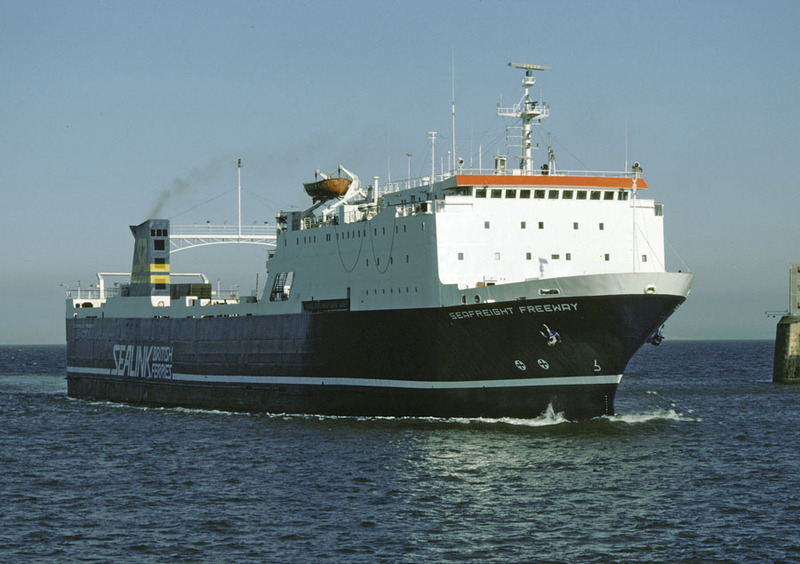 March 2003: Commenced service between Karlshamn – Liepaja. 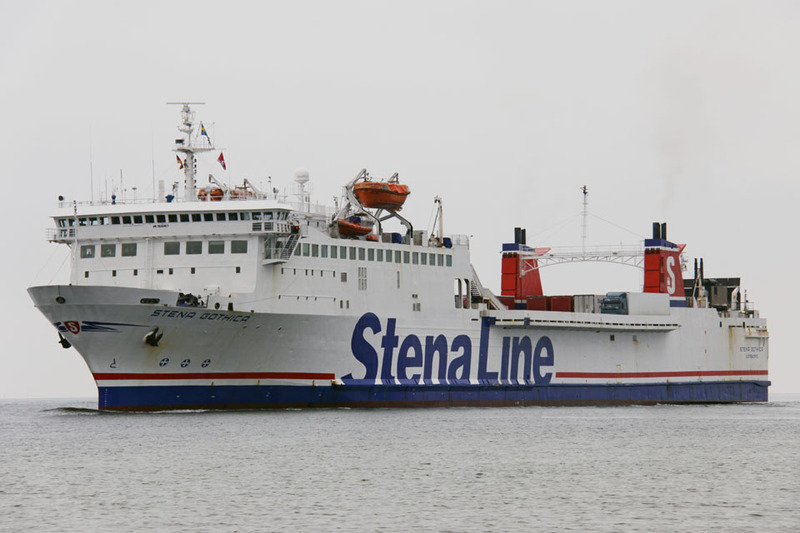 April 15th 2003: Chartered to Stena Line, Göteborg. Commenced service between Trelleborg – Travemünde. 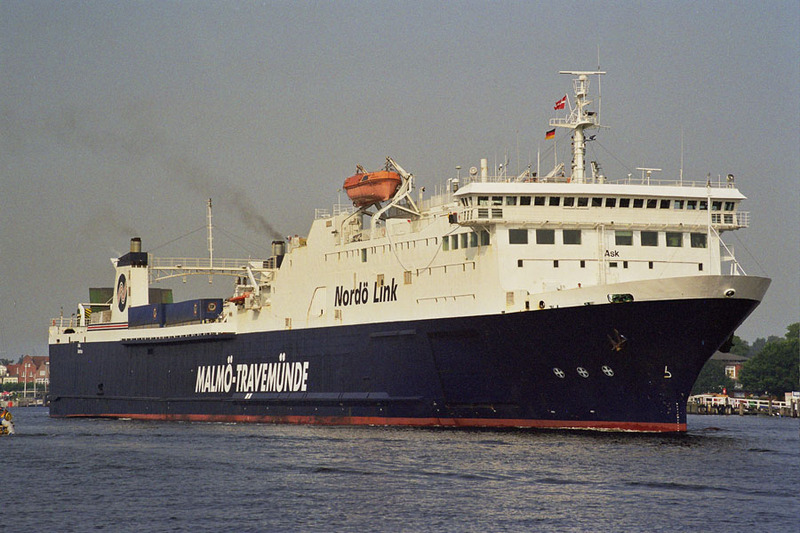 August 14th 2003: On departure from Travemünde, she was the victim of a bomb alert. She returned to the port, police searched the vessel and found nothing. 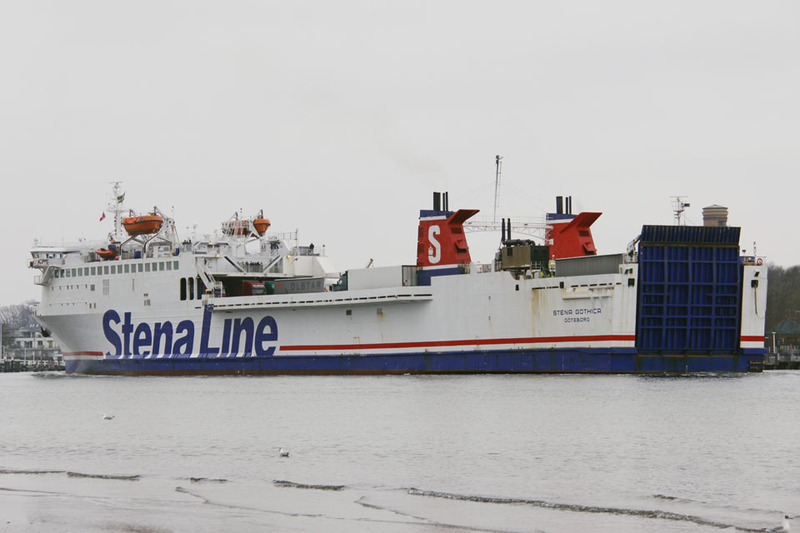 April 1st 2005: Completion of charter to Stena Line (Scandlines services between Trelleborg – Travemünde). April 2005: Commenced services between Nynäshamn – Ventspils for a short time. May 25th 2005: Laid up in Puttgarden. May 30th 2005 – June 3rd 2005: Bareboat chartered to NATO, for transport between Bornholm/ Northland – Sandefjord. June 4th 2005: Laid up in Puttgarden. June 2005: Bareboat chartered to Iscomar, Spain for three months. Operated between Valencia – Palma. 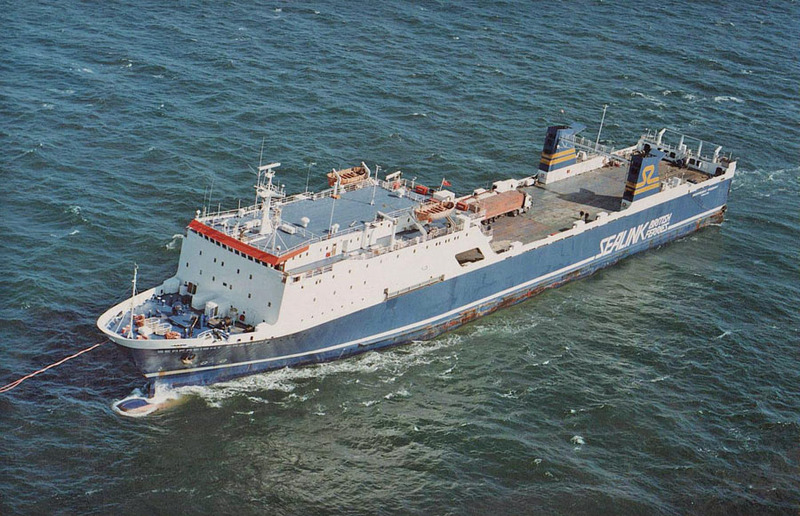 October 1st 2005: Introduced between Rostock – Ventspils. January 16th 2006 – February 5th 2006: Some services between Karlshamn – Ventspils. 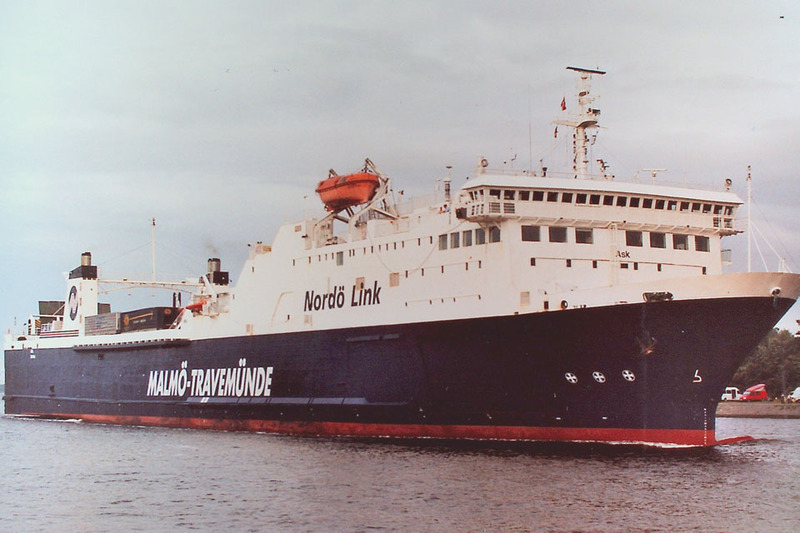 January 3rd 2007 – January 12th 2007: Operated between Nynäshamn – Ventspils. January 2007: Service between Rostock – Ventspils. 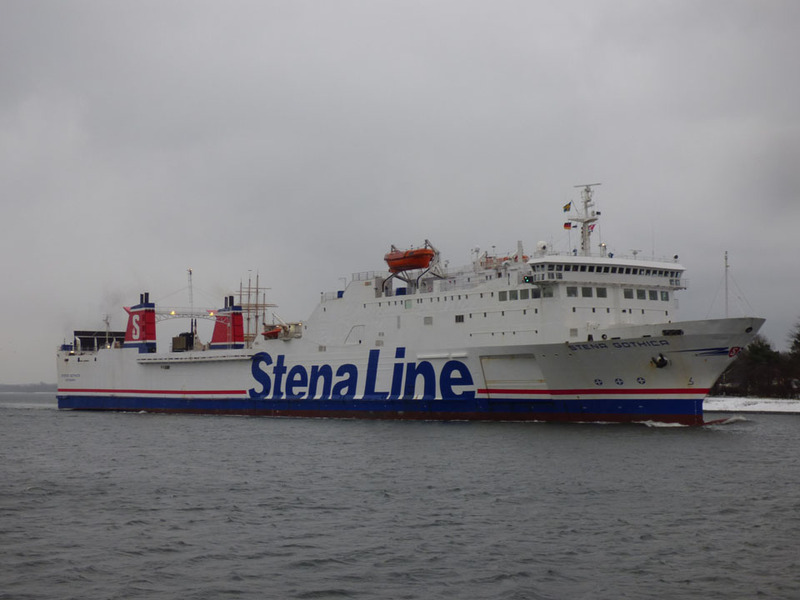 January 4th 2009: Operated between Ventspils – Nynashamn. January 2011: Operated between Liepaja – Travemünde. 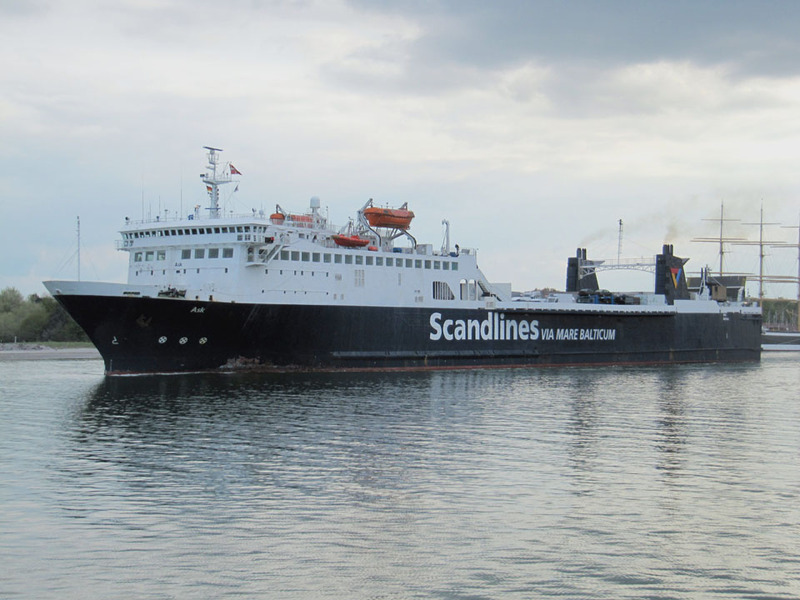 June 2011: Chartered for 1 month to SOL Continental Line for services between Travemünde – Helsingborg. July 2011: Charter completed charter and laid up in Nakskov. September 2011: Commenced service between Travemünde – Liepaja. 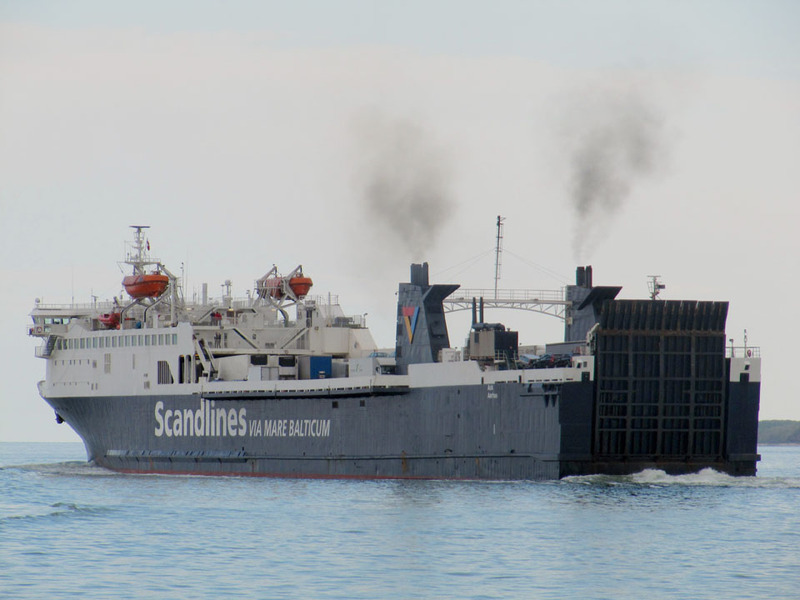 October 20th 2014 – April 2015: In service between Ventspils – Nynäshamn. July 25th 2015: Services between Frederikshavn – Göteborg. August 7th 2015: Final day in service Frederikshavn – Göteborg. August 8th 2015: Laid up in Lysekil. August 24th 2015: Left Lysekil for Göteborg. 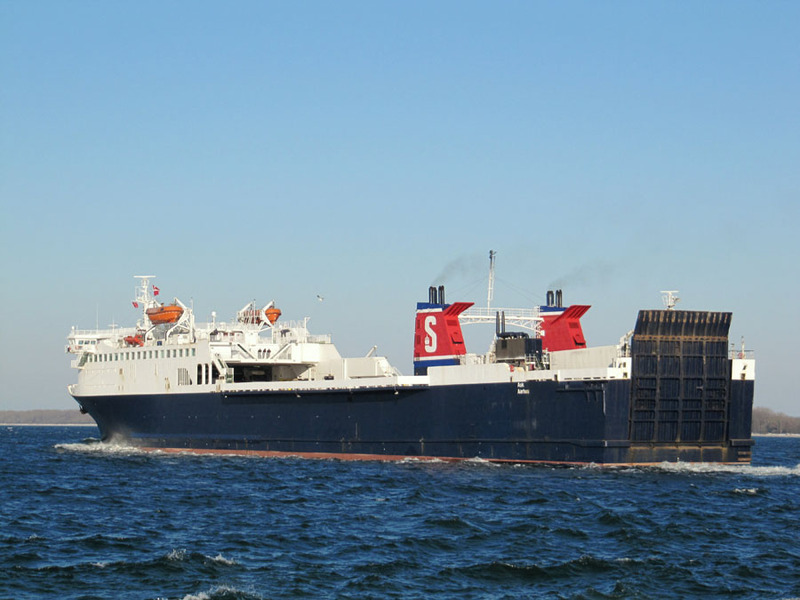 August 25th 2015: Commenced services between Göteborg – Frederikshavn replacing the STENA SCANRAIL. 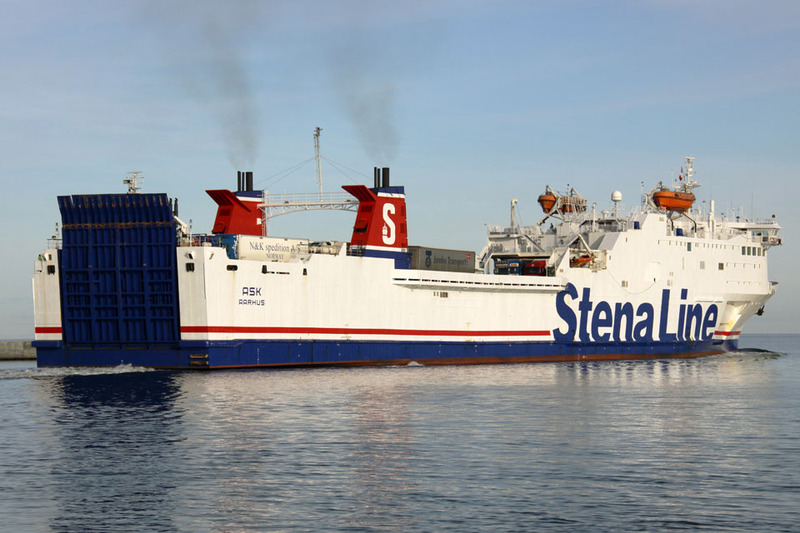 September 28th 2015: Transferred to Swedish flag home port Göteborg and renamed STENA GOTHICA. October 6th 2015: Upon arrival at the port of Frederikshavn, Denmark, the ship developed a severe list to the port side. This was later attributed to the malfunctioning of her anti-heeling system. 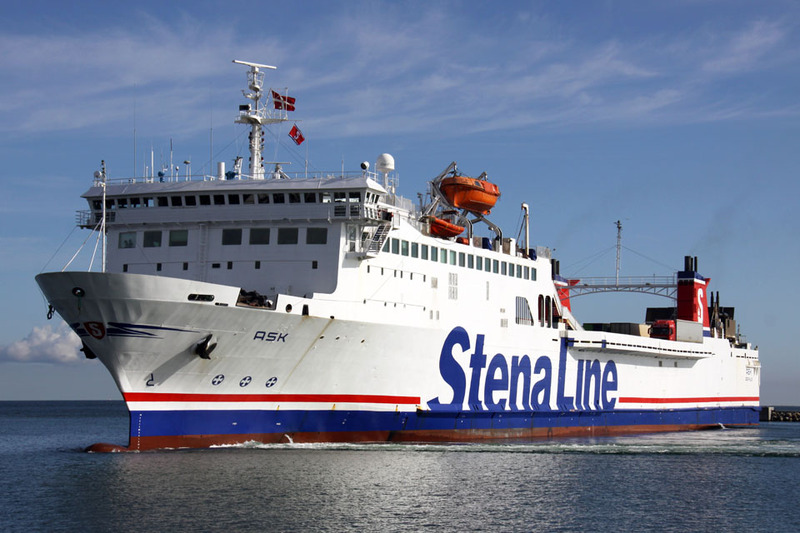 November 26th 2015 – December 4th 2015: Extra services between Göteborg – Kiel. December 5th 2015: Services between Göteborg – Frederikshavn. 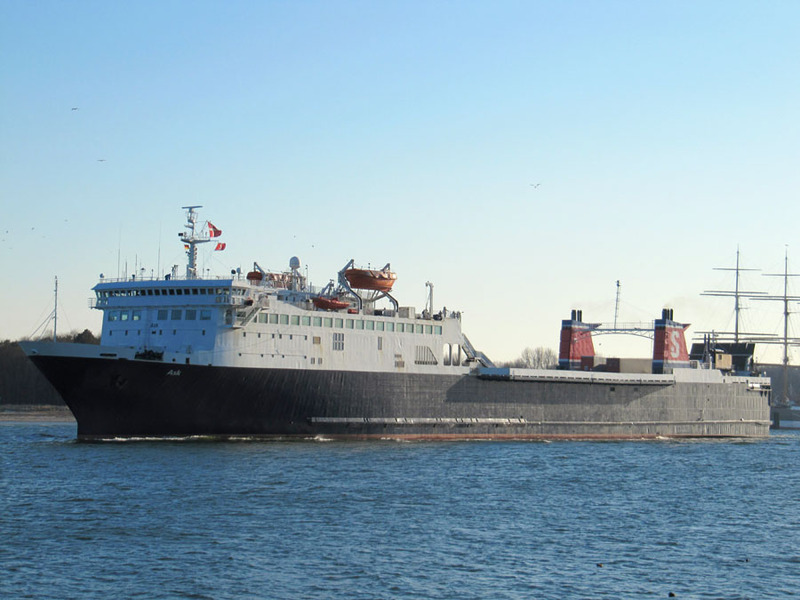 January 8th 2016: From the 9th of January to the 12th of March will serve the route between Travemünde and Liepaja in place of the STENA FLAVIA. 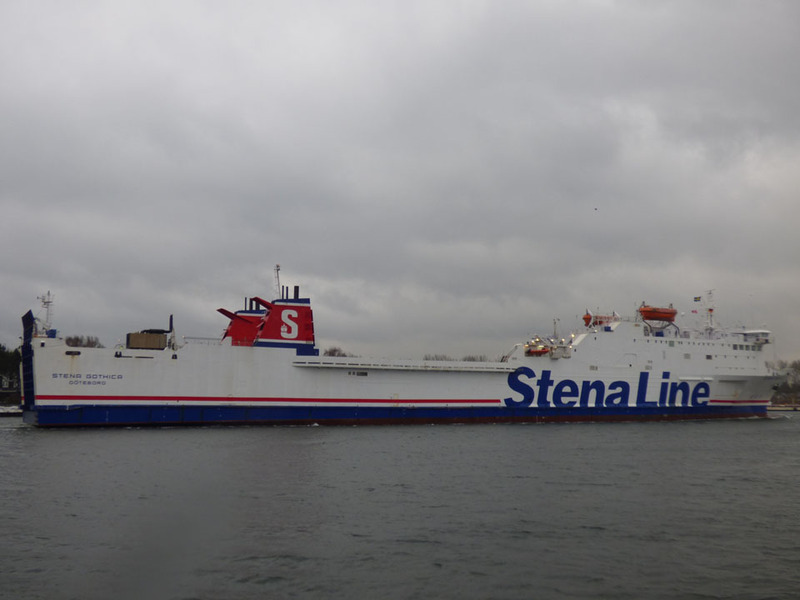 January 7th 2016: Left Göteborg for Travemünde. January 9th 2016 – March 2016: Services between Travemünde – Liepaja/ Ventspils and Liepaja/ Ventspils – Nynäshamn. March 2016: Services between Göteborg – Frederikshavn. April 1st 2016 – April 12th 2016: Services between Halmstad – Grenå. April 2016: Services between Göteborg – Frederikshavn. October 2016 – November 11th 2016: Services between Hoek Van Holland – Killingholme. November 13th 2016: Services between Travemünde – Liepaja. February 13th 2017: Left Travemünde for Trelleborg. February 13th 2017: Services between Trelleborg – Rostock. March 19th 2017: Commenced service between Göteborg – Frederikshavn. We would like to thank: Tim Becker, Brian Fisher, Fotohaus Pamperin, Frank Heine, Dennis Hopkins, Ted Ingham, Pieter Inpyn, Dirk Jankowsky, Ken Larwood, Mike Sartin, Jörg Seyler and Andreas Wörteler for their assistance in producing this feature. All information is believed to be correct and no responsibility is accepted for errors and omissions. Special thanks goes to the World Ship Society (East Kent Branch).